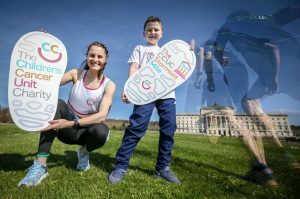 Belfast boy Reece Magill joined Ireland Athlete and European medalist Ciara Mageean to launch a unique running event this Summer, in aid of the Children’s Cancer Unit Charity. The CCUC Stormont Mile will see hundreds of runners completing the distance from Parliament Buildings to the entrance of the Stormont Estate. The Charity is inviting individuals, businesses and even politicians to take part, with the incentive of supporting the important work of the Children’s Cancer Unit. Reece, age 10, is currently receiving treatment for Leukemia at the Unit at the Royal Belfast Hospital for Sick Children, where he will continue to visit regularly until September 2020. At the launch, he encouraged runners of all ages and abilities to get involved on 30th June. He said: “The Children’s Cancer Unit is a very special place. When I am there, I am looked after by some of the best doctors and nurses in the world and they make me feel so much better. I hope lots of people will join me at Stormont on the 30th June to help raise funds for our team. During a brief visit home, Ciara Mageean helped launch the event and passed on some expert tips for training ahead of the big day. She added: “I am delighted to be involved in this exciting event, alongside Reece who is such an inspiring boy. Today we have tested out the route and everything seems to be in order, although I can tell that I already have some stiff competition! The one-mile course will start in front of Parliament buildings, with runners completing a small section of the mile route on flat ground before racing downhill along the Stormont Estate driveway to the gates. Anna McDonald from The Children’s Cancer Unit Charity explained the rationale behind the event. “We are always looking for new ways to support children and families affected by childhood cancer in Northern Ireland. All funds raised through The CCUC Stormont Mile will go directly towards supporting the vital work of the medical team at the Children’s Cancer Unit. The CCUC Stormont Mile takes place on Sunday 30th June at the Stormont Estate. All entrants will receive an entry pack which includes a souvenir tee shirt. Cost of adult entry is £20.